Alan Turing’s story is fascinating on its own, but when he is portrayed by Benedict Cumberbatch, under the direction of Morten Tyldum with musical accompaniment of Alexandre Desplat it becomes remarkable. Turing is the stuttering, socially inept mathematician who spent years of his life attempting to break the Enigma Code. The Enigma Code was used by the German Army during World War II to send messages to their troops. Turing eventually was able to break the code and it is estimated that in doing so he shaved as much as two years off of the length of the war. 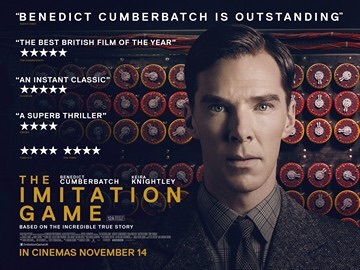 Turing’s story is well known but The Imitation Game breathes fresh air into the facts. Cumberbatch lands on both feet as he expels the complexity and earnestness of Turing. There are as many layers visible in his character as in any real man and they are tangible and engrossing. Cumbertbatch is joined by Kiera Knightly who gives equal depth to her portrayal of the only woman on the Enigma Project, Joan Clarke. Clarke holds her own with an all male environment while she struggles to be faithful to her family and herself. Turing’s story ends in tragedy. Although considered a war hero, the British Government repaid his service to society by charging him with the crime of committing illicit acts due to his homosexual lifestyle. After charged he was forced to take medicines which were described as “chemical castration.” He died shortly before his 42nd birthday from cyanide poisoning. There have been some complaints that the film-makers didn’t spend more time on this segment of Turing’s story. I disagree. For me it was suitably explained and presented, the inexcusable action of the government becomes even more cogent when the focus is on Turing’s achievements rather that his demise. Already nominated for multiple year end awards this is a beautifully filmed, delicately performed, elegantly produced picture about the strength of conviction, the beauty of accomplishment and the faults in policy that can destroy genius.